It's here. Grown men become boys for just a minute, excited at the prospect of playing in a World Series and walking away with a championship ring. All the money and fame can't come close to the prospect of being a World Series Champion. At this point, no one knows, for sure, who will own a 2010 World Series Champion Ring. Except for Bengie Molina. Before a single inning is played, Molina is a lock for a ring. The only question is which team will be on that ring. 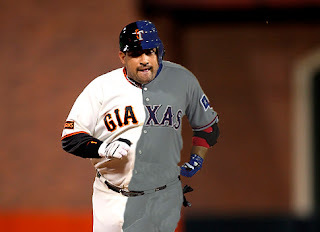 Molina is in the unusual position of having played enough games for the San Francisco Giants at the beginning of the year to qualify for the Giants championship roster, while having been traded early enough to the Texas Rangers to qualify as a member of the Rangers' championship roster. So he'll walk away with a ring regardless of the outcome of the Series. Something tells me he'll be happier if the Texas Rangers win.